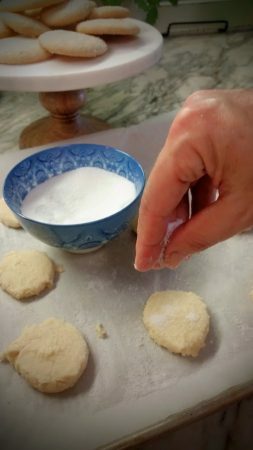 Sharing a great recipe today for Sugar Cookies — the cookies the Flour Girls are baking for their mission project you can read about here. It’s a recipe I have had in my files for years. I am not even sure how I came across it, but I know it’s been as long as my nieces have been around and the oldest is almost 40! At Valentine’s Day they are perfect to sandwich together with a layer a buttercream frosting or lemon curd. This is not a roll-out dough so it’s not conducive to rolling and cutting with cookie cutters. 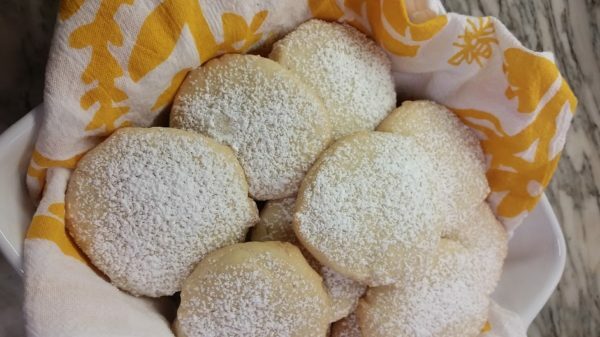 It’s a spoon onto the cookie sheet, press with a sugared glass recipe. You can add extracts, like lemon or almond, to change up the flavor. In fact, I think Champagne flavored extract would be perfect for a wedding shower! For this recipe, I added 2 tsp of lemon extract. So fresh for summer. Cream butter and sugars in large mixing bowl. In a small bowl beat eggs and add in oil and extracts. Mix into butter/sugar batter. Mix flour, soda, salt and cream of tartar in a bowl. Incorporate a little at a time into batter until well mixed. The batter will be sticky. Spoon a teaspoon full of dough onto a cookie sheet lined with parchment paper (I usually put 12 drops of dough on each cookie sheet). Press gently with the bottom of a drinking glass dipped into sugar (keep a damp cloth or paper towel handy to get the sugar to adhere to the bottom of the glass). Sprinkle with more sugar, or colored sprinkles, before baking. Bake at 350 degrees about 10-12 minutes until edges are just slightly brown. 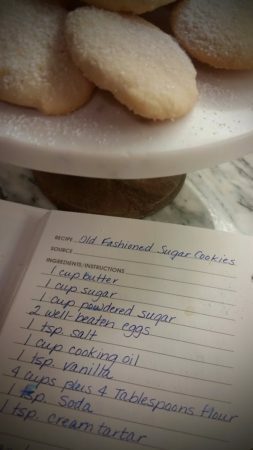 The recipe makes about 70 cookies.